A knee sprain is an injury of the ligaments, tough bands of fibrous tissue that connect the bones of the upper and lower leg at the knee joint. The knee joint has four major ligaments. Anterior cruciate ligament (ACL) — The ACL and the posterior cruciate ligament (PCL) bridge the inside of the knee joint, forming an "X" pattern that stabilizes the knee against front-to-back and back-to-front forces. The ACL typically sprains during one of the following knee movements: a sudden stop; a twist, pivot or change in direction at the joint; extreme overstraightening (hyperextension); or a direct impact to the outside of the knee or lower leg. These injuries are seen among athletes in football, basketball, soccer, rugby, wrestling, gymnastics and skiing. Posterior cruciate ligament (PCL) — The PCL works with the ACL to stabilize the knee. It most often sprains because of a direct impact to the front of the knee, such as hitting the knee on the dashboard in a car crash or landing hard on a bent knee during sports. In athletes, PCL injuries are most common among those who play football, basketball, soccer and rugby. Medial collateral ligament (MCL) — The MCL supports the knee along the inner side of the leg. Like the ACL, the MCL can be torn by a direct sideways blow to the outside of the knee or lower leg, the kind of blow that can happen in football, soccer, hockey and rugby. The MCL can be injured by a severe knee twist during skiing or wrestling, particularly when a fall twists the lower leg outwards, away from the upper leg. Lateral collateral ligament (LCL) — The LCL supports the outer side of the knee. 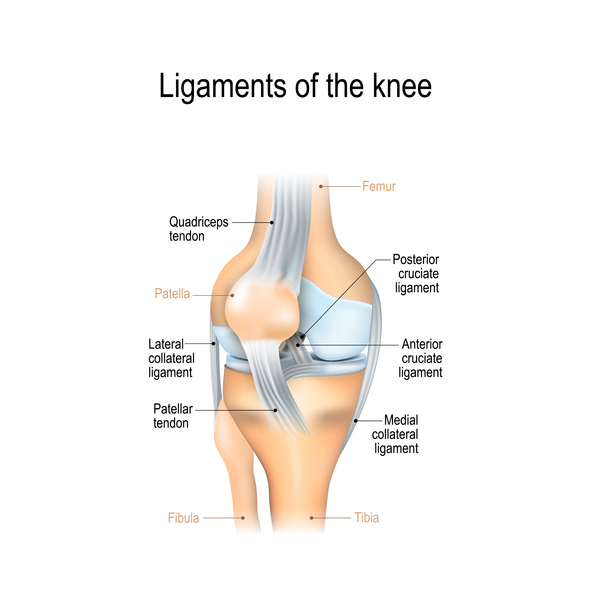 It is the least likely knee ligament to be sprained because most LCL injuries are caused by a blow to the inside of the knee, and that area usually is shielded by the opposite leg.